So where do you begin when it comes to vertical gardening? There are a number of reasons for growing plants in urban areas on vertical structures. Whatever you’re looking for, adding a vertical structure to an urban garden is a space saver and can provide a three-dimensional element of colorful and creative context to your urban garden. Growing on a trellis is an efficient and cost-effective way to develop your vertical garden. Even a 12-inch-wide planter can accommodate a wood trellis. Besides acting as a plant support, a series of trellis panels can work well as a privacy screen between you and your neighbor or provide a vine-laden fence to block an unattractive view. 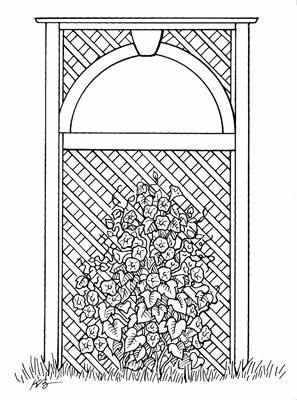 Some common plants to grow on trellises include climbing roses, clematis, morning glory, grape vines cucumbers, peas, and summer squash. If the trellis is going to be placed adjacent to a wall, it needs to be attached with supports. You can support the trellis with small, wooden blocks between the trellis and the wall. Securely mount your blocks to the wall and the trellis to the blocks. Be sure the blocks hold the trellis a minimum of 4 inches away from the wall. Woody vines planted and trained to climb an arbor or pergola create a beautiful and definitive urban garden space. Once the plantings are established, they provide a break from direct summer sun and also help screen unsightly views. Arbors are smaller, simpler structures than pergolas. 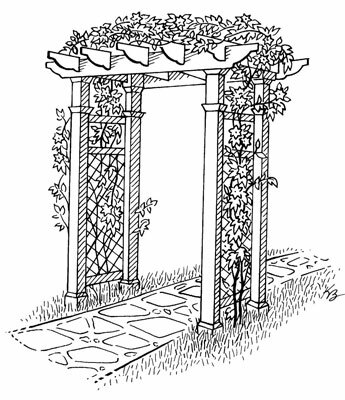 A garden arbor is typically used as an entry feature and is at least 3 or 4 feet wide and is often arched above. 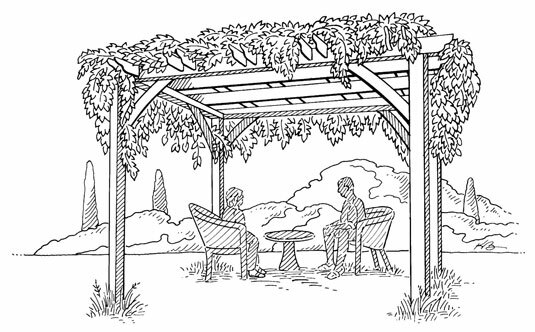 A pergola is a much larger structure and usually given much more architectural treatment than an arbor. Trumpet Honeysuckle (Lonicera sempervirens) — This climbing vine is noted for its colorful, trumpet-shaped flowers, sweet scent, and attractiveness to butterflies and hummingbirds and can grow 10–20 feet. Select a site with full sun to shade and moist, well-drained soil. The plants will flower more profusely in full sun. Zones 4–10a. Crossvine (Bignonia capreolata) — The native vine sports rusty brown-red to yellow blooms. The dazzling variety ‘Tangerine Beauty’ is a showstopper with its tangerine-to-coral blooms. It blooms profusely in spring and more sparsely later in the season, and also attracts hummingbirds. Plant in full sun to part shade. Zones 5–9. Trumpet creeper (Campsis radicans) — The “wild” version is often cursed as a rampant weedy vine. Newer cultivars like ‘Madame Galen’ and ‘Georgia’ offer larger blooms and have a place as a strong vine for a large arbor or to cover the expanse of a western wall. Full sun to part shade. Zones 4b–10a. Wisteria (Wisteria spp.) — Several species and varieties are available. Long cascades of blue-to-purple flowers in spring. Looks great trained along the top of a fence and cut back heavily each winter. Also outstanding for the side walls and ceiling of a large, sturdy pergola. Full sun to part shade. Be careful not to plant wisteria vine too close to foundation walls as the root system is very vigorous! Zones 5–9. Carolina jessamine (Gelsemium sempervirens) — This evergreen vine puts on a spring show of trumpet-shaped yellow blooms. Great for a post or vertical lattice-type outdoor wall. All parts of the plant are poisonous. Full sun to part shade. Zones 5b–9b. Lady Banks rose (Rosa banksiae) — Long, arching, thornless canes bear yellow blooms in spring. Needs lots of room and a sturdy trellis support to do its thing. A lightly fragrant, white blooming form is also available. Full sun. Evergreen in zones 9–11 and deciduous in zones 6–8. Check your hardiness zones to ensure these plants are appropriate for your region. Of course many city residents, condominium owners, apartment dwellers, and urban residents have limited space to develop a complete vegetable garden each season. Vertical garden teepees can create the additional space needed to help urban gardeners grow a larger and more abundant vegetable garden. 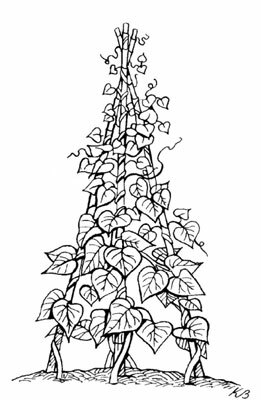 Pole (climbing) beans — Excellent climbers and many varieties. Cucumbers — Although not real climbers, cucumbers can easily be trained by weaving it along your trellis as it continues to grow. Grapes — Excellent climbing perennial vining varieties. Melons and pumpkins — Provide additional support to fruit. Peas — For large harvests, plant tall growing varieties. Squash — Be sure to select vining varieties. Tomatoes — Select indeterminate varieties to train up a trellis or use tomato cages. Keep the size of your vertical support system in mind with the size of your garden planting. A simple square-foot vertical grid system made of garden twine may support your climbing beans, even the cucumbers too, but you’ll likely need a stronger and more rigid system to support heavier squash, melon, and pumpkin plantings. Support heavy fruits like cantaloupe or muskmelon with a “sling” made from pantyhose, a piece of T-shirt fabric, or a mesh bag that produce comes in. When you garden vertically, you can tighten up the spacing of your plants. It is usually the horizontal competing growth that restricts the spacing of your plantings.